AutoCanada buys FCA dealership in Guelph, Ont. 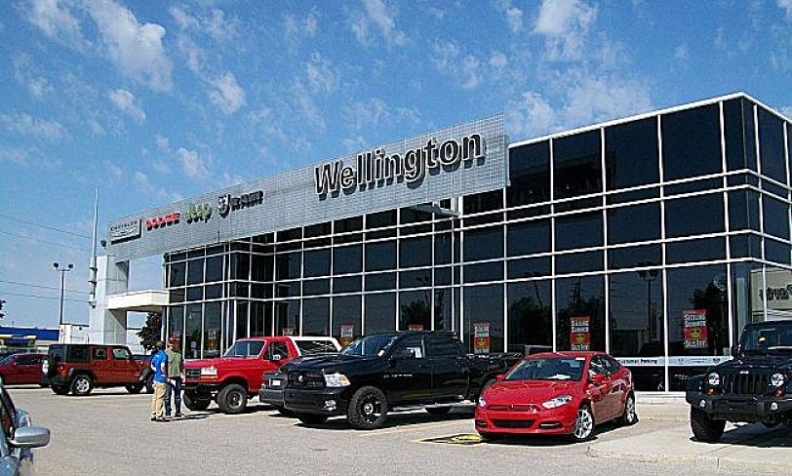 Wellington Motors in Guelph, Ont., has a 12-car showroom and 16 service bays. AutoCanada Inc., a publicly traded auto dealership group that operates in eight provinces, has purchased Wellington Motors in Guelph, Ont. The deal increases AutoCanada’s number of Ontario dealerships to seven. It bought the nearly-40,000-square-foot dealership (3,800 square metres) on Oct., which includes a 12-car showroom and 16 service bays, on Oct. 4. AutoCanada, which is based in Edmonton, now has 56 dealerships and more than 3,700 employees in eight provinces. In 2015, the 75-year-old Wellington Motors, which sells Chrysler, Dodge, Jeep, Ram and Fiat vehicles, reported revenue of about $61 million. Neither party said how much AutoCanada paid for the dealership. “We are thrilled to acquire such a flagship store in Ontario,” AutoCanada CEO Steve Landry said in a statement. Wellington Motors had been owned and operated by Ted Woods and his son Mike. It recently celebrated its 75th anniversary. Ted Woods, whose father founded the business, suffered and survived a recent stroke. Mike Woods said he and his father “hugely respect Steve Landry” and that’s why they decided on the sale. “We had lots of offers over the years. This was something we really had to ponder. The more we thought about it, AutoCanada was the right fit,” Mike Woods said. Ted Woods is now doing fine and officially retired Oct. 17. “The Woods family has been a staple in the Guelph community and AutoCanada intends to continue that strong tradition,” Landry said in his statement. Mike Woods said his only concern about the sale was that the transition be seamless. To that end, longtime Wellington Motors employee Sam Fairhill took over as general manager. Mike Woods told Automotive News Canada he didn’t want “anyone orphaned” by the sale, that includes his employees, suppliers and customers. He wont hold an official job or title at Wellington Motors but said his services will be available to AutoCanada, free of charge and available by phone, “for as long as it takes” to make the transition smooth and seamless.